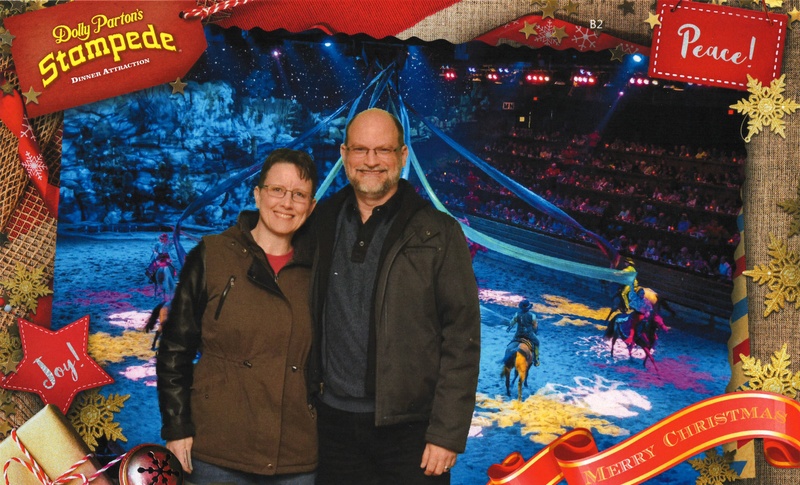 For our Winter Break of 2018, Wendy and I opted to return to Branson for a few days after Christmas. The first semester of this school year was never a dull moment, with each of us continually engaged in challenging technology work. So we deliberately avoided any school-related work, emails, etc. during our stay in the tourist town. We needed to relax and were ready to be pampered a bit. We had enjoyed our stay at the Keeter Center at the College of the Ozarks during Spring Break 2015, so we returned there to be pampered by the attentive students of Hard Work U. They turned down the beds each night, leaving us cookies they had made and milk from the college dairy, and brought us a tasty breakfast each morning of mostly farm-to-table items. We made sure to provide gratuities for the various students throughout our stay, who work at stations across the college in lieu of tuition. We arrived late on a Friday afternoon. After checking in, we dined at the Dobyns Dining Room in the Center, where the hosts, servers, cooks, and bakers are all students working for their cost of education. Wendy had country fried chicken, and I had prime rib. We were seated near a piano and were pleased when a student came over and began to play during the meal. The main attractions at Branson are the various live shows, and we enjoyed the old-style Presley’s Country Music Jubilee show on our previous visit. On Saturday, after a light lunch at a Subway and a walk through the Branson Landing outdoor shopping mall, we took in the Christmas dinner show at Dolly Parton’s Stampede. The show featured 32 horses with stunt riding, singing, two skaters performing on a tiny ice rink lowered from the ceiling, and various tableaux. The menagerie included camels, sheep, goats, pigs, dogs, and a donkey. Dinner was markedly different from the previous day at Dobyns. We consumed without the benefit of cutlery some creamy vegetable soup, a biscuit, a Cornish game hen, a slice of barbecued pork loin, corn on the cob, a potato, and apple turnover. Thankfully they also provided warm towelettes. I had originally hoped to hike at the Lakeside Forest on Sunday, but it was too cold and rainy for that. My plan to have lunch at the Godfather’s Pizza in Branson was also foiled, as it was closed on Sundays. I really had a hankering for their pizza, since I got hooked on it at Campus Corner in Norman back in my undergraduate days yet there are no franchises near Bartlesville. The internet revealed there was another location, open on Sundays, a 30-minute drive north in Ozark. Wendy was willing, so off we went. After lunch we needed to walk, and I recalled there was an art museum in Springfield only a 20-minute drive away. At first we were the only visitors, viewing three galleries containing the exhibit El Grabado: Contemporary Cuban Printmaking. Drs. 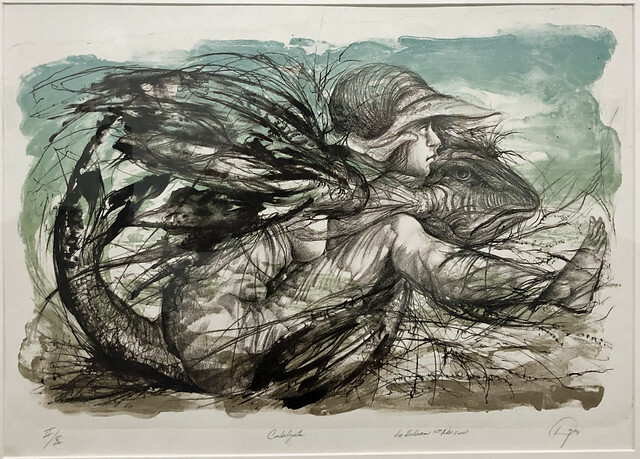 Tony and Luz Racela of Kansas City had provided from their private collection 70 prints created by 33 artists at Cuba’s Taller Experimental de Gráfica de Habana. There were several images of skeletal figures by Julio César Peña Peralta, including Jimaguas (Twins) and Clases de grabado (Lessons of Printmaking). I liked the intense expression on the girl in Cabalgata (Ride) by Daysi Carmona Pérez. Most of the works were lithographs (stone-writing) where an image was drawn with oil, fat, or wax onto a limestone plate, which was treated with acid and gum arabic to etch areas not protected by the image. When the stone was moistened, the etched areas retained water and would repel oil-based inks. Then a blank paper sheet would be applied to transfer the ink from the image areas to form a printed page. In the 1800s thousands of lithographic stones were imported into Cuba from Germany, along with machines from France and Germany, to create lithographic seals and rings for Cuban cigars to fight counterfeit products. The switch to embossed aluminum seals in the 1950s meant many lithographic stones were repurposed as field stepping stones and the like, but some of the apparati were preserved. A red woodcutting machine from 1829 is still used today by artists at the Taller Experimental de Gráfica de Habana. The Springfield Art Museum has over 9,000 works in its collections, built up since 1928. In its main galleries it had an exhibition that was a cross section of the collection with particular emphasis paid to the ways its works reflect our country’s history as it developed its identity. 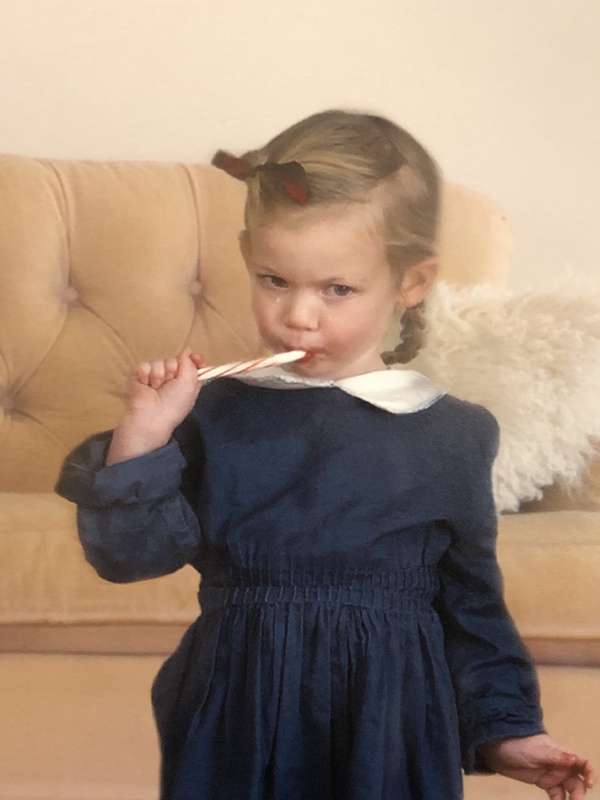 This included works by George Caleb Bingham, Asher B. Durand, Jackson Pollock, Grandma Moses, Robert Motherwell, Wayne Thiebaud, and Alison Saar. 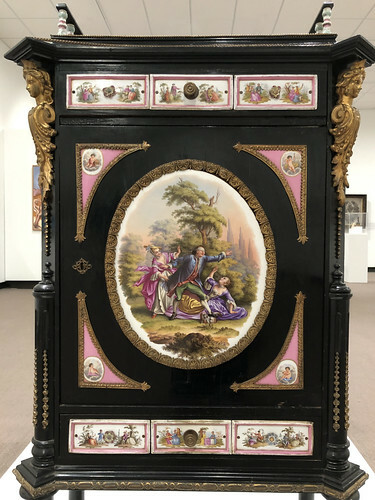 There were some furnishings on display, and a 19th century ebony cabinet with porcelain inserts caught my eye. 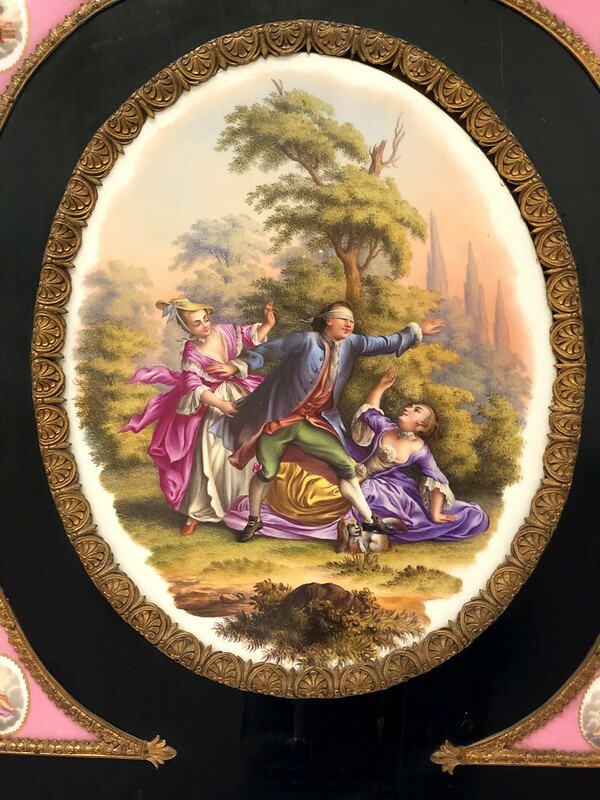 Most of the inserts were vague images of couples and cherubs, while the large centerpiece showed a blindfolded man playing hide and seek with two damsels. I was amused at how his left foot was about to step on a dog whose face was a bit too human, with what appeared more like a girl’s hair than dog ears. His right hand also appeared to almost be cupping one woman’s breast. His anatomy seemed questionable, given the oddities of his right leg and the suggestive folds in his leggings. 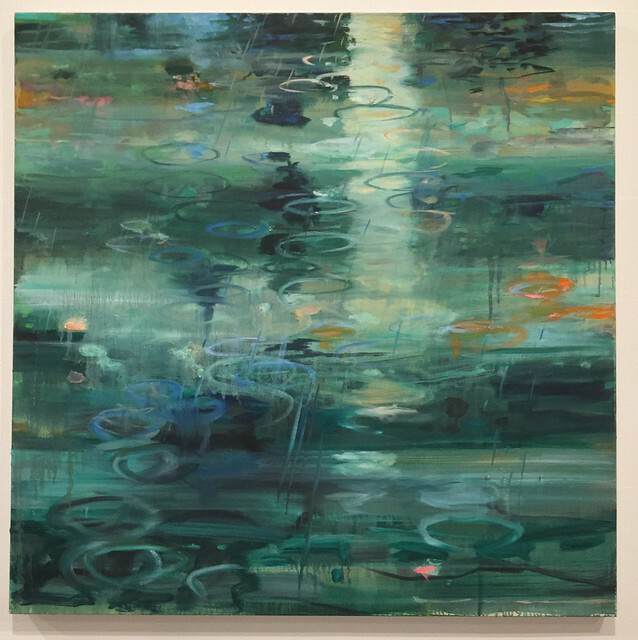 Wendy is always on the lookout for color schemes she might use in her own paint pours, and noted Nell Blaine’s First Lyme Landscape and Michael Mazur’s Pond Rain. 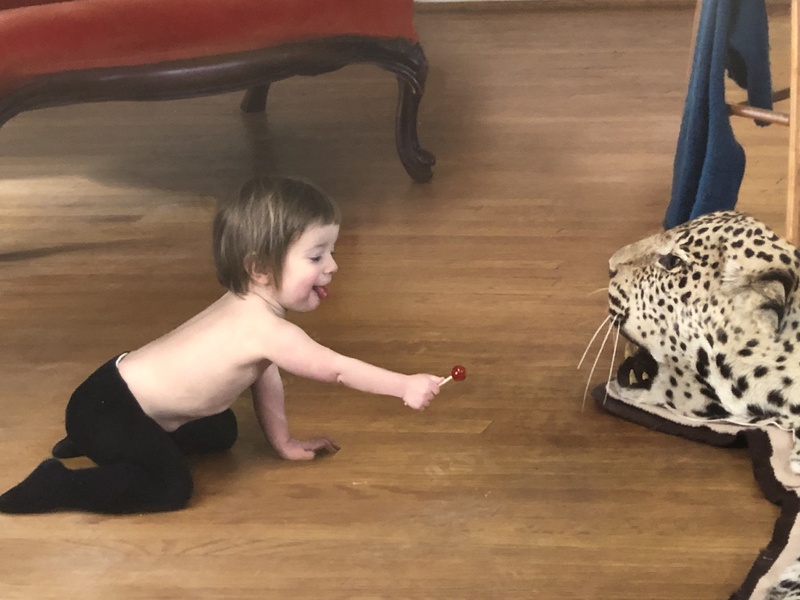 Living in Oklahoma, we are regularly exposed to western art at area museums. I was pleased that the museum had some pieces that broke away from the typical works reminiscent of Remington and Russell. 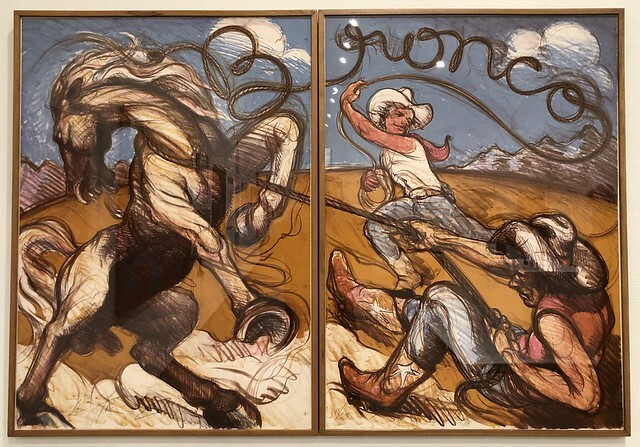 I liked the high energy of the cartoonish lithograph Bronco by Luis Jiménez. He is better known as a sculptor, with his memorable Mustang at the Fred Jones, Jr. Museum of Art in Norman. Tragically, he was killed when the torso of a larger version of that statue fell on him in 2006 in his studio. 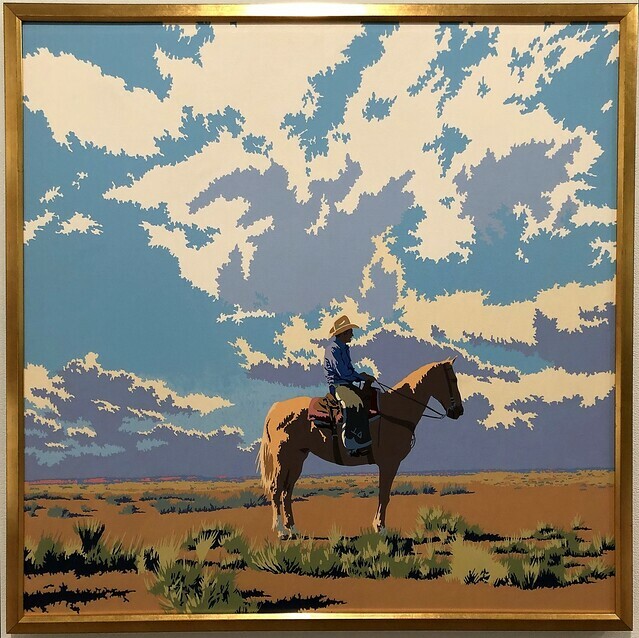 Wendy and I both enjoyed William Schenck’s Where Have All the Cattle Gone, with its static-edged clouds, the colors of the distant hills, and the choice to render the cowboy and much of his horse in shadow. 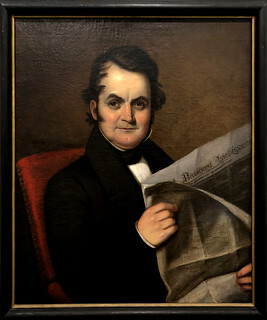 19th century and earlier American portraiture can often seem amateurish and off-putting, but the smug expression on Samuel M. Charles’ Self-Portrait made me wonder what he was thinking as he read his paper. 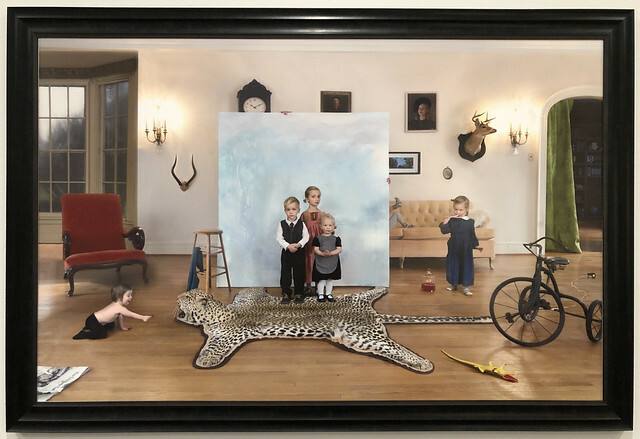 I loved Julie Blackmon‘s Portrait, a large photograph that appeared rather painterly, finding the composition visually interesting and the expressions on several of the children’s faces quite amusing. It is part of her Homegrown series. A native of Springfield, her works are part of permanent collections in museums across the country, reflective of her talent in composing memorable scenes. 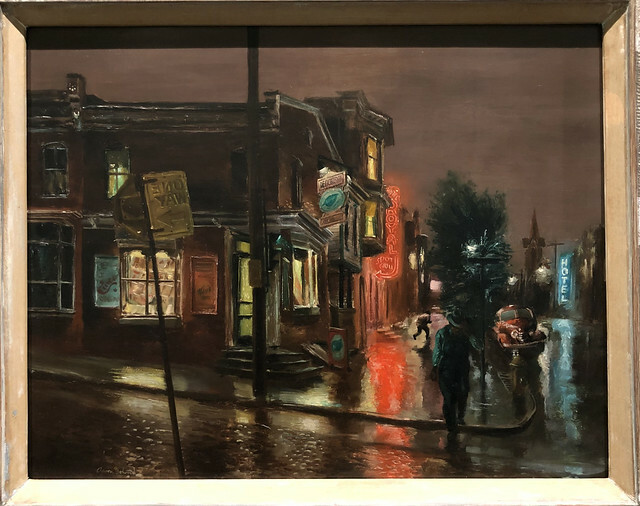 Aaron Bohrod’s Rainy Night, Wilmington wonderfully depicted city signage, including the reversed embossed One Way sign in the foreground and glowing neon hotel signs. I suppose the distant running figure is more likely headed through the rain from one hotel to the other than making his way toward the dark and distant cathedral. 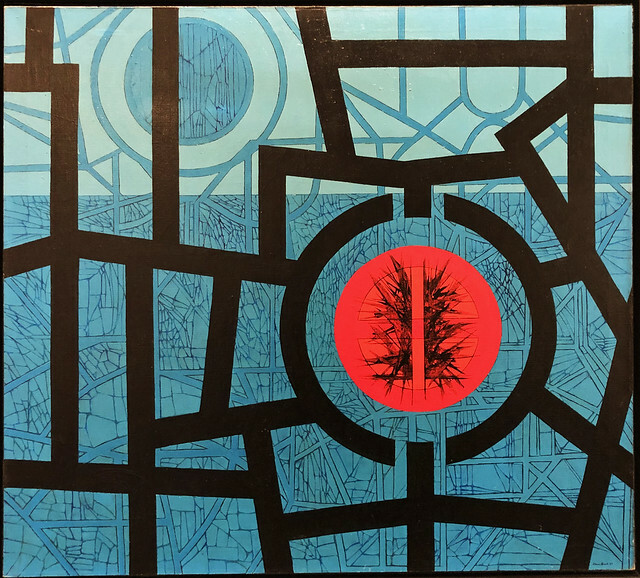 Abstract expressionism is often cold, but I liked Jimmy Ernst’s Dayscape with its bold circle of red and strong foreground pattern against a cool cyan background, somewhat reminiscent of stained glass. 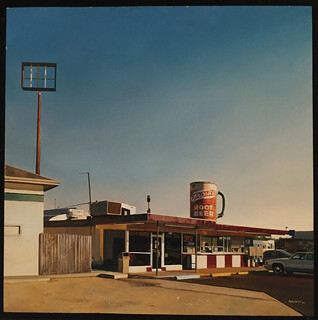 Wendy admired Andrew Abramoff’s skill at manipulating oil paint with photographic clarity and realism in Fast Food, New Orleans, although the subject matter struck me as banal. I wonder what he found appealing about that restaurant. Was it the giant mug of root beer on the roof? Or did he also like the decayed midcentury modern American architecture? 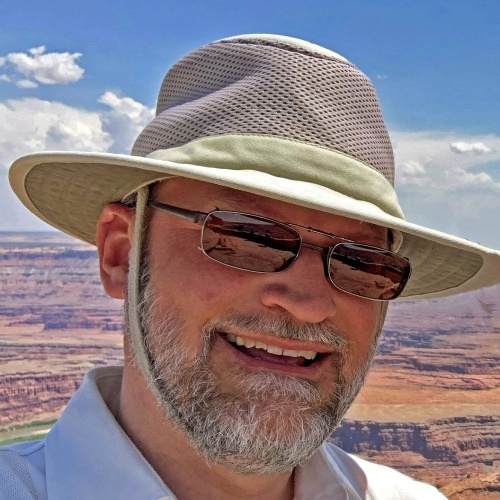 Before coming to America, he had trained and restored 17th century icons and frescoes in Russia. Midcentury modern is getting more love these days. But having grown up surrounded by it and bearing witness to its rapid decay, I find much of it bland and depressing. 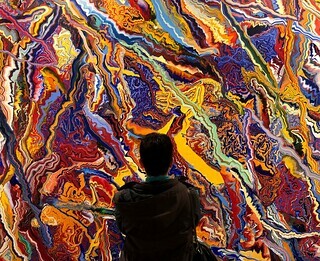 Wendy loved the work, which reminded me of a series of painting pours with particularly vivid colors. 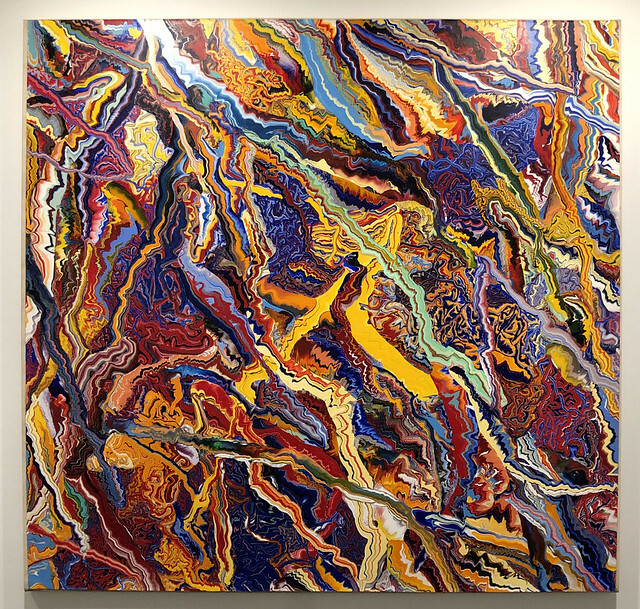 Owen described such works as abstract landscapes in microcosm, a response to his working environment in the Adirondacks, with the ripples and layers of paint suggesting the movement of water as viewed from above. The museum reports that painting is the subject of the most Instagrams from its collection, and we could see why. We had a wonderful visit at the museum; so much better than my previous one years earlier. The works were interesting, and the staff members were friendly and helpful. While I appreciated the free admission, I happily placed a donation in their box. We will certainly be back in the years to come. And we’ll someday return to Branson, to be pampered again at the Keeter Center and take in another fun show. We took Wendy’s new minivan on this trip, enjoying its comfortable ride across some rather rough highways and having plenty of easily accessible cargo space. For longer trips with luggage it sure beats traveling in my Camry. We returned to Bartlesville for New Years and then I went back to work for three days while Wendy remained on vacation. Having fewer distractions with school out of session, I was able to finish a couple of lingering technology projects. Soon classes will resume with us refreshed and ready to take on another semester. 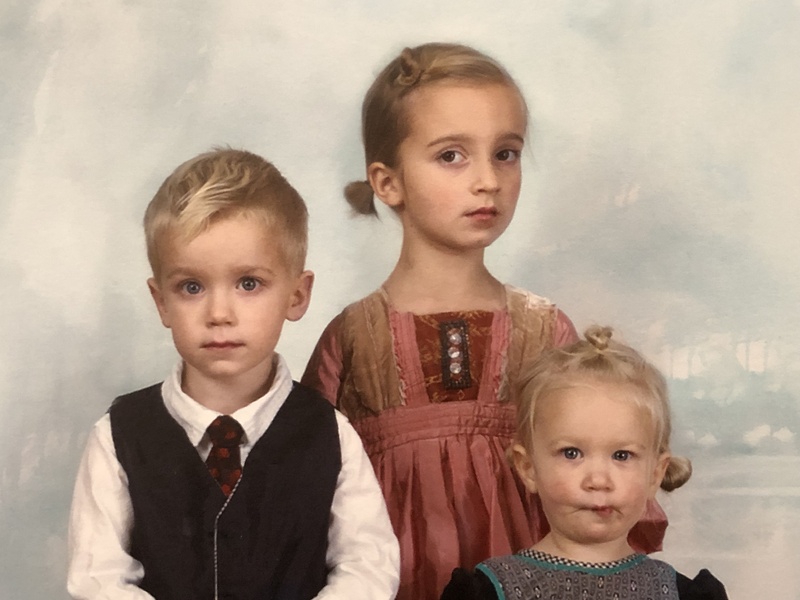 This entry was posted in art, photos, travel. Bookmark the permalink.